Family Trust Federal Credit Union wants to help you reach your financial goals this summer! In turn, they want to help the Clover LEAF Foundation. 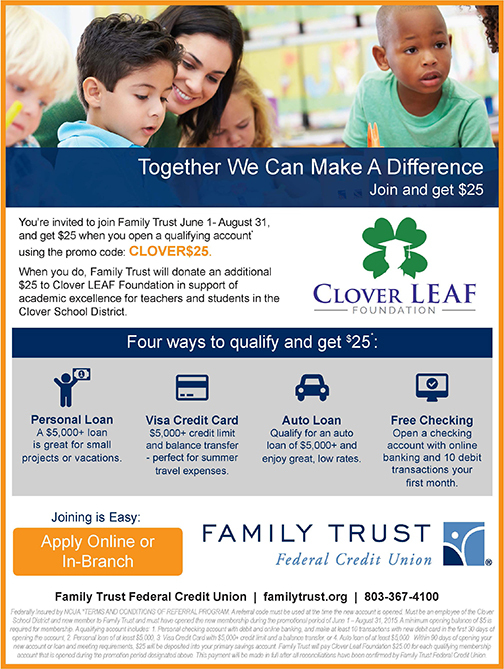 Participate in one of the 4 qualifying actions between now and August 31 and Family Trust will give YOU $25 AND will donate $25 in your name to the Clover LEAF Foundation. Get started today at FamilyTrust.org! The Clover Leaders for Educational Advancement Foundation, Inc. (Clover LEAF) is a non-profit organization dedicated to supporting teachers and students in the Clover School District. We provide grants to teachers to support innovative classroom projects and programs to foster engagement and innovation inside and outside of the school community. Clover LEAF is a 501 (c) (3) organization and contributions are tax-deductible to the full extent the law allows. The Foundation does not provide financial support for programs regularly funded by the Clover School District operating budget. Strict management of fiduciary responsibility is a basic tenet of the Foundation.